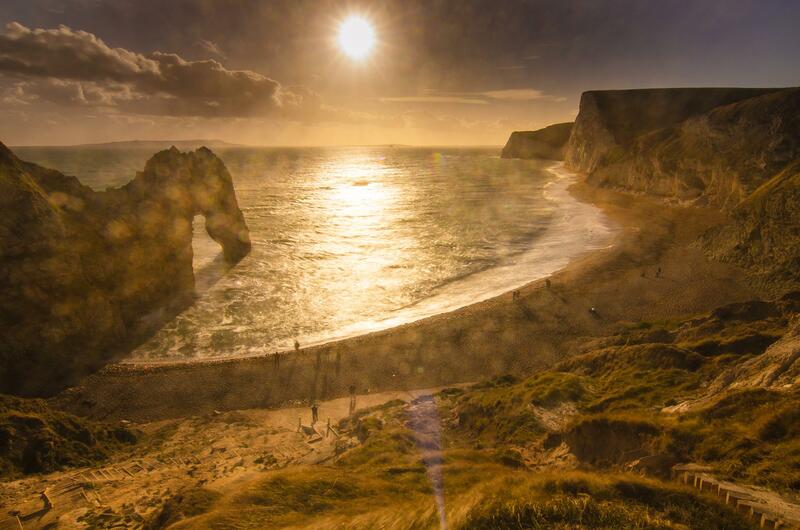 The sky at Durdle Door was much less heavy the following day, but the wind was probably stronger. After getting there, I went straight to the location that I’d decided on the day before and set everything up. As the sun went down, I took a number of groups of photos, all with a 10 stop ND filter. Each group was at different exposures ranging from 1/4s to 15s so that I could capture the sky, sea, and land and use exposure blending to create the final image. So I set to carefully cleaning the filter, which was made more challenging in the high wind as the grit was quite sticky, so difficult to remove without scratching the filter and I was very concerned that the camera might fall when I wasn’t holding it down. After this, although I was careful to keep the camera covered between shots, I still needed to clean everything a few more times before I finished for the day. I was hoping that I’d get a photograph with the sun really low on the horizon and some more after it set, but a bank of cloud came in before that happened. Although it wasn’t quite what I was hoping for, I’m happy with the final result. I kept the long exposure of the sea in the final picture so that the scene appears calm and peaceful, unlike the experience of taking the photograph at the time! Love your photos of the Scottish Highlands and the water running down that stream. Thanks for the kind comment. I have just started so sell A4 prints on an Etsy shop – https://www.etsy.com/uk/shop/GeoffMacDonaldPhoto – I’ve not offered them framed as people often like to choose their own. If you let me know some more details about the frame via the Etsy shop, I’ll set up a custom order for you.